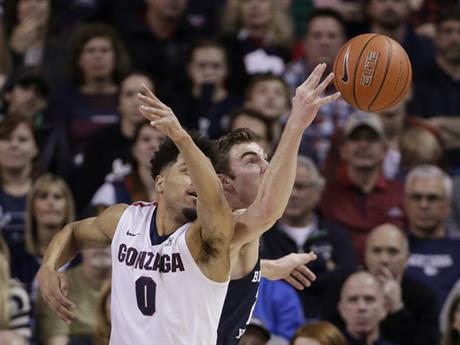 SPOKANE, Wash. (AP) — Top-ranked Gonzaga’s quest to go undefeated this season ended under a barrage of baskets by BYU’s Eric Mika on Saturday night. Mika had 29 points and 11 rebounds, and BYU upset Gonzaga 79-71. It was the Cougars’ first victory ever over a No. 1 team, after four losses, and spoiled the Bulldogs’ perfect record in their last regular season game. The sophomore center made 10 of 14 shots from the floor and 9 of 13 free throws. His biggest basket was a 17-foot jumper that put BYU ahead 73-71 with a minute left in the game. Gonzaga lost the ball on its next two possessions, and then Corbin Kaufusi had a putback and Mika hit two free throws to put the game out of reach. Gonzaga ended a string of 15 consecutive games where it didn’t trail in the second half. The Cougars rallied from an early 16-point deficit, and Mika said the team never wavered in its belief it could win. The Cougars scored 44 points in the second half and made nine 3-pointers to just three for Gonzaga. Nigel Williams-Goss scored 19 points for Gonzaga (29-1, 17-1 West Coast), which was seeking to become the first team since Kentucky in 2014-15 to finish the regular season without a loss. Gonzaga missed 13 of its 29 free throws and had 16 turnovers, but still led most of the game. T.J. Haws added 17 points and Elijah Bryant 14 for BYU (21-10, 12-6). The last team to finish the entire season undefeated was Indiana in 1975-76. Gonzaga came out fired up and jumped to an 18-2 lead in the first five minutes, making 7 of 10 shots. 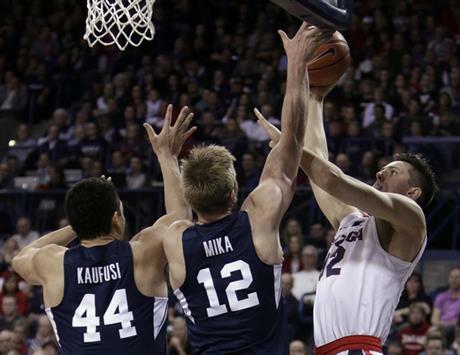 The Zags cooled off, and three consecutive 3-pointers by BYU’s Haws cut Gonzaga’s lead to 26-22. Mika’s basket cut Gonzaga’s lead to one point before the Bulldogs closed with a 10-5 run to take a 41-35 lead at halftime. Zach Collins’ putback gave Gonzaga a 58-46 lead midway through the second. 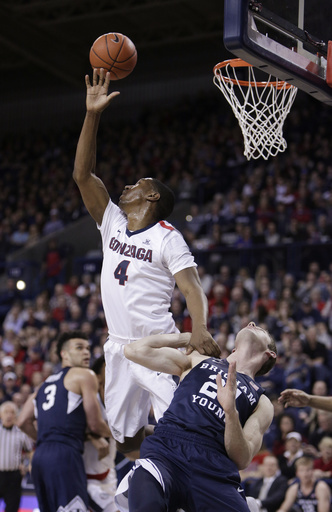 A technical foul on Gonzaga’s Few helped BYU cut its deficit to 58-53 and seemed to spark the Cougars. A pair of 3-pointers by Nick Emery cut Gonzaga’s lead to one, and Mika’s basket gave the Cougars their first lead at 61-60. The teams traded baskets until Mika put the Cougars ahead for good. Rose spoke after the game about how impressive the Zags season is. BYU: The Cougars won the previous two games in Spokane and lost by just 10 points to the Bulldogs in Provo earlier this season. Mika averages 19.9 points and 9.3 rebounds per game. Gonzaga: The Bulldogs have won their 20th WCC title and fifth in a row. Four of the previous five teams to start the season 29-0 in the last 40 years have advanced to the Final Four. Five Gonzaga players scored in double figures. Johnathan Williams had 12 points and 12 rebounds for the Zags. Both teams shot 45 percent from the floor and both teams had 38 rebounds. BYU plays in the WCC Tournament in Las Vegas next week. Gonzaga plays in the WCC quarterfinals in Las Vegas next Saturday.